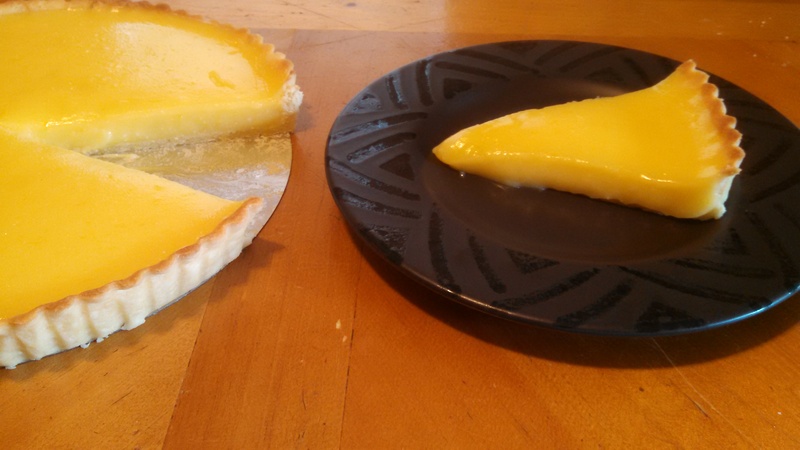 I found Meyer lemons at the fancy grocery store last week and couldn’t wait till the weekend to turn them into something tasty…it was a long week! Yesterday was finally the day. 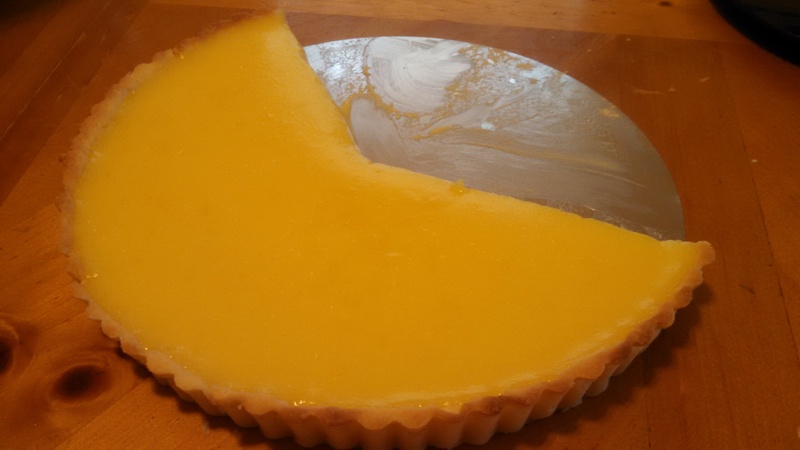 I’d decided to try Anne Burrell’s recipe for a ‘Meyer Lemon Curd Tart’. 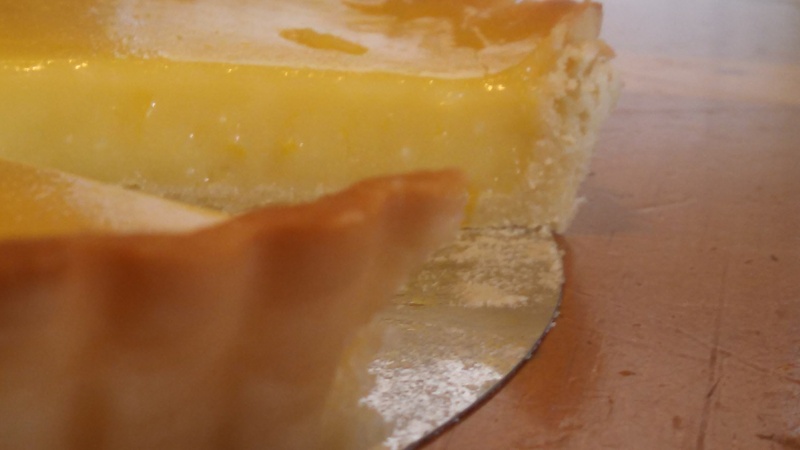 We’ve only ever made one tart before (ala Heston Blumenthal) and it was a long, complicated process, which, in my opinion, wasn’t reflected in the taste. This was part of my apprehension, the other was I only bought a 1 lb. bag and didn’t want to muck it up! First things first, I blitzed the crust together in my food processor (it was a very moist dough) and put it in the fridge to chill for half an hour. I had several things going in the kitchen yesterday and found plenty to do with that time! 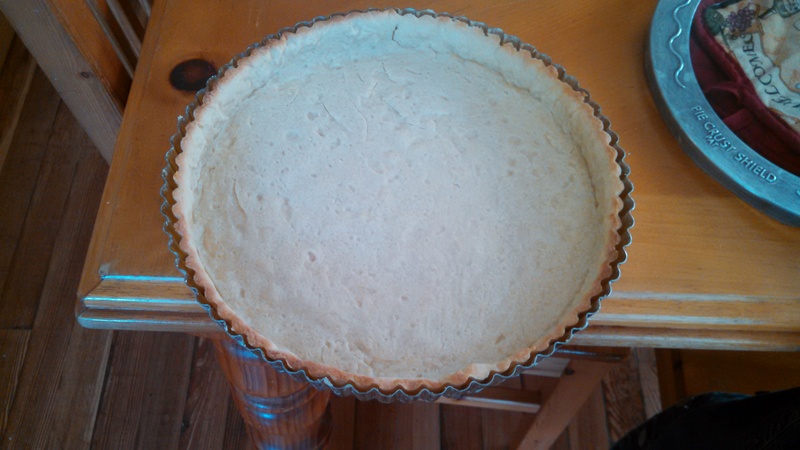 Rolled it out once, but it was so moist that it absorbed the flour and I found it was stuck to the counter. I dusted it liberally with flour, scraped it up and folded it back together, then re-rolled. Much better! 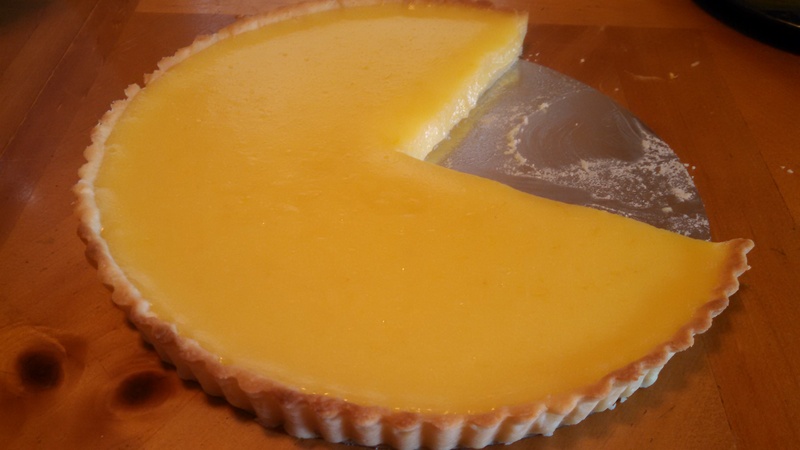 This time, I had no issues whatsoever when I tried to roll it around the pin to transfer it onto the tart pan (newly purchased at ‘The Restaurant Store’ for just this occasion) and easily placed, arranged and trimmed it. Trimming was the easiest thing, I simply rolled the pin over the top of the pan, slicing of the extra and getting a nice, uniform edge. I followed Anne’s instructions to line the shell with foil for baking and poured some of the contents of my coin jar on to that for a “pie weight”, a tip from our first tart experience, though Heston had us use parchment paper, which let the oil from the butter through and I had a fun time getting it back off my coins. Foil worked perfectly, but I think I’ll fold it over the top edge next time, so that it browns a bit more evenly. Now for the curd! I had 8 lemons and it took 7 1/2 of the to get the 3/4 C. I needed. I also had to zest three of them, this took the longest, cracking 5 eggs and adding salt and sugar was far quicker. On to the stove, whisking and whisking, paranoid that it might burn. It was very easy to tell when it had cooked enough, the consistency changed, yes, but the color changed too, so there was no second guessing there, which made me happy. Poured it into the shell and put it into the oven. Let it in for the max time (and as long as I dared! ), then pulled it out, though it still seemed a little swimmy. Now the hard part, letting it cool. Fortunately, I had those other things I mentioned earlier to focus on and didn’t suffer too badly. After 3 hours, during which it had moved out of the kitchen and into the air-conditioned living room, we declared it cool enough and he sliced into it (I was too scared). Mmmm. 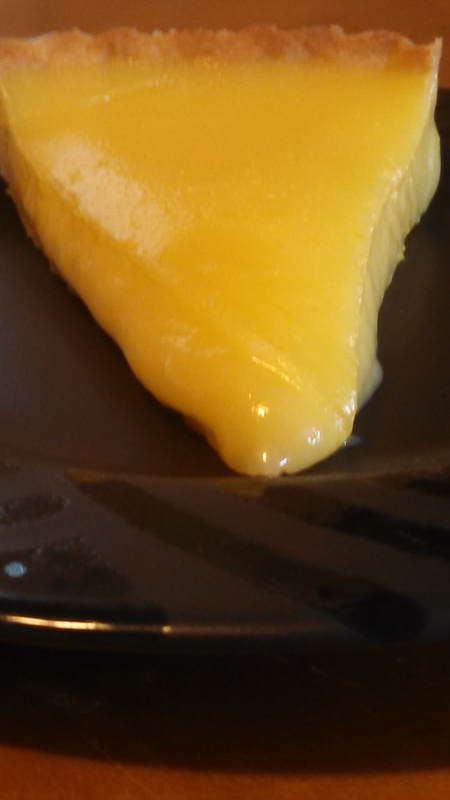 It was rather perfect, if I do say so myself, maybe could have baked another 30 seconds, but the flavor, yum, lemon! The texture was good too, smooth and creamy. He liked it too (see below). First we shared a slice. Then I had one of my own. Then he had one more. How do you know when it’s good? When you eat half of it in one sitting! This entry was posted in Dessert! 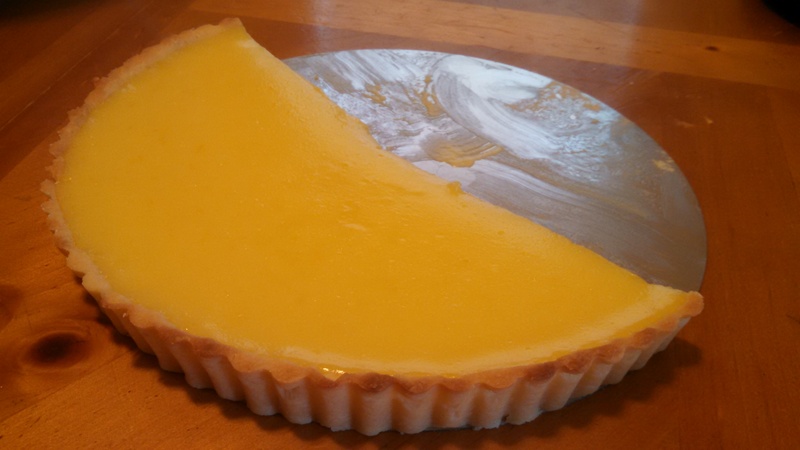 and tagged Anne Burrell, Baking, Firsts, Lemon Curd, Lemons, Meyer Lemon Curd, Meyer Lemons, Tarts. Bookmark the permalink.